CDT1 is a component of the replication licensing system and promotes the loading of the mini-chromosome maintenance complex onto chromatin. Geminin is an inhibitor of CDT1 and prevents inappropriate re-initiation of replication on an already fired origin. This region of CDT1 binds to Geminin (PUBMED:15286659). 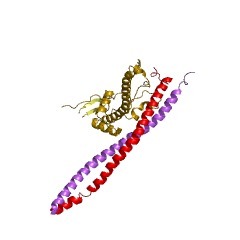 This entry represents the geminin-binding domain of the DNA replication factor CDT1 and related domains whose functions are not known [(PUBMED:15286659)]. There are 1576 CDT1 domains in 1573 proteins in SMART's nrdb database. Taxonomic distribution of proteins containing CDT1 domain. This tree includes only several representative species. The complete taxonomic breakdown of all proteins with CDT1 domain is also avaliable. Click on the protein counts, or double click on taxonomic names to display all proteins containing CDT1 domain in the selected taxonomic class. 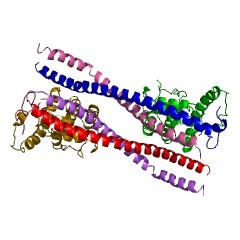 Structural basis for inhibition of the replication licensing factor Cdt1by geminin. To maintain chromosome stability in eukaryotic cells, replication originsmust be licensed by loading mini-chromosome maintenance (MCM2-7) complexesonce and only once per cell cycle. This licensing control is achievedthrough the activities of geminin and cyclin-dependent kinases. Gemininbinds tightly to Cdt1, an essential component of the replication licensingsystem, and prevents the inappropriate reinitiation of replication on analready fired origin. The inhibitory effect of geminin is thought toprevent the interaction between Cdt1 and the MCM helicase. Here wedescribe the crystal structure of the mouse geminin-Cdt1 complex usingtGeminin (residues 79-157, truncated geminin) and tCdt1 (residues 172-368,truncated Cdt1). The amino-terminal region of a coiled-coil dimer oftGeminin interacts with both N-terminal and carboxy-terminal parts oftCdt1. The primary interface relies on the steric complementarity betweenthe tGeminin dimer and the hydrophobic face of the two short N-terminalhelices of tCdt1 and, in particular, Pro 181, Ala 182, Tyr 183, Phe 186and Leu 189. The crystal structure, in conjunction with our biochemicaldata, indicates that the N-terminal region of tGeminin might be requiredto anchor tCdt1, and the C-terminal region of tGeminin prevents access ofthe MCM complex to tCdt1 through steric hindrance.